Putting technology companies in direct contact with end users, strategic partners and investors. The global Technology Approval Group (TAG) programme represents a unique, no-cost opportunity for innovative companies. TAG is a forum for connecting innovators with people whose job it is to seek out new technology on behalf of large public and private sector organisations. Individually reaching out to these people through the normal channels is expensive and time consuming. Through TAG we bring them all together in one place, specifically to hear your pitch. There are regular TAG meetings in Europe, the US, Australia and the Philippines. Current themes include municipal water/wastewater (our longest running theme), industrial water and cleantech in the built environment. The TAG programme is funded by the end-users, over 100 large organisations from around the world. Technology companies participate for free. Innovations are considered purely on technical and commercial merit. 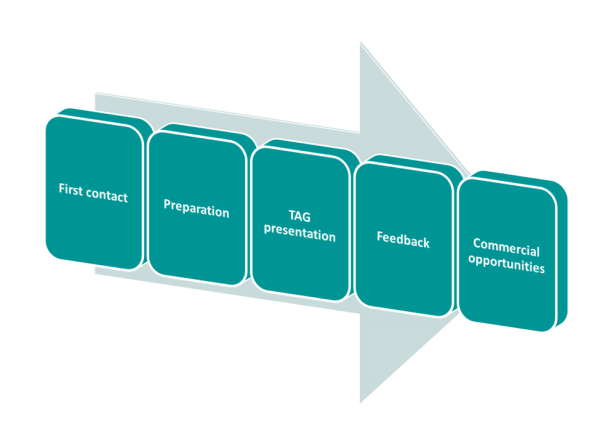 Generally speaking, the TAG programme is best suited to technologies that are market-ready or near-ready. However, we are still interested to hear about early-stage products. For topics of particular interest end-users do sometimes get involved early in the development process. If the time is not right for TAG we may be able to offer connections to funding or strategic partners. We were contacted by Isle in 2013 and since then we had opportunities to present our technology in the UK, Europe and the US. As a result we received valuable feedback from qualified experts, and made contacts which are turning into commercial leads. We were very pleased to work with Isle and their young and energetic team, and the process added tremendous value to our company. Good job Isle Utilities! Isle gave us unbelievable support and showed hands-on interest for our TAG presentation. Their professionalism, help and focus are unequalled, and their commitment to new technologies and the industries they serve is a blueprint for how business and innovation can thrive. Isle and the TAG forum is exceptional and one-of-a-kind! We know that working with Isle Utilities on an ongoing basis is not just smart, it’s critical. We look forward to a long, lasting and profitable relationship with Isle. Isle Utilities have greatly helped us shape our message, focus our product and reach a clearer definition of what we do. We have found Isle’s TAG process useful as a trusty soundbox. Baseform’s solutions benefitted from exposure to potential partners in a positive and constructive frame of mind, abbreviating first-contact barriers and facilitating to-the-point communication.